"In my most recent work, Endless Summer", the textuality central to my earlier works resurfaces. The quilt I have created is the convergence of years of works as an artist. It references my rural childhood, and my 1970's sculptural interpretation of that upbringing, but also stands alone as an innovative contemporary piece, a juxtaposition of the disparate art forms of quilt making and digital manipulation." Maude Boltz’s career in the arts began in the late 60s, yet she would not fully emerge onto the women’s art scene until 1972. For many women artists reconciling their professional ambitions with their womanhood proved difficult, and, like so many of her peers, Boltz was confronted with an acute sense of shame and inferiority regarding her status as an artist. It was at an early meeting with her co founders at A.I.R., during which they shared slides of each other’s work, that Boltz experienced the feelings of community and pride she had lacked previously. From this point on, Boltz began to gain more recognition for her unique sense of materiality expressed via sculpture. The structures she designed were often described as “wood sculptures,” though canvas, dyed cloth, hemp, chains, and other materials frequently appear in the work as well. The strength of each construct lay in the relationships created between these seemingly disparate substances; relationships made possible through a respect for the materials as well as knowledge of their capabilities and limitations. If Boltz’s work contains a common theme, it can be summarized as aesthetic beauty coexisting with an analytical exploration of material and form. 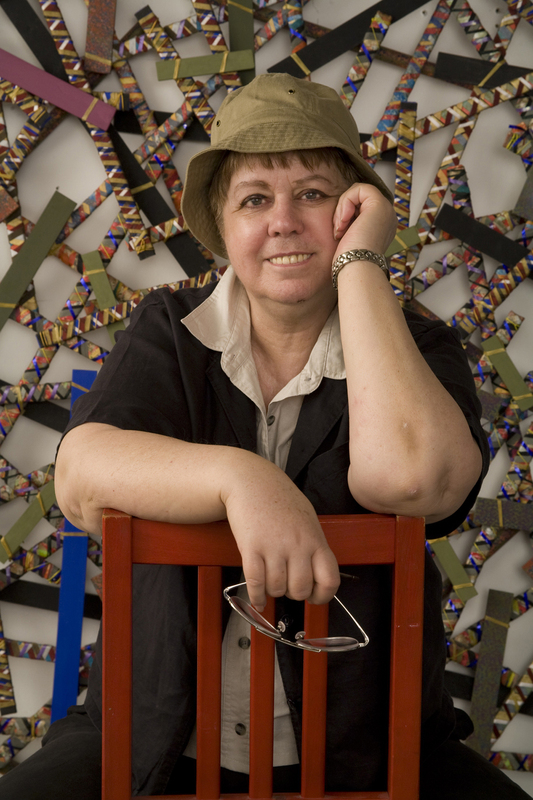 In addition to sculpture Maude Boltz is known for her paintings, installations, drawings, and watercolors. She received her Bachelors in Fine Arts from the Philadelphia College of Arts in 1962 and a Masters in Fine Arts at the Yale University of Art and Architecture in 1964. As a co founder at A.I.R. Gallery, Boltz took on the responsibility of photographing her fellow artist’s work, effectively archiving much of what was shown at the gallery in its early days. She has shown extensively in the U.S. and has participated in shows abroad, notably the first European Women’s show at Amerika Haus in Hamburg, Germany in 1972. Her awards include a Virginia Center for the Arts Fellowship, and a C.A.P.S. grant for graphic art.